This small, ecologically and culturally diverse country is easily accessible to travelers from the U.S. Renown for the Galápagos Islands, Ecuador has three other distinct regions—the Andean, the Pacific Coastal and Amazonian regions—all easily visited in one trip. Whether you prefer an active vacation, cultural immersion or surrounding yourself with wildlife and nature, Ecuador has something for every traveler. The Andean region runs from north to south down the spine of Ecuador, featuring spectacular volcanoes, many with their peaks covered in snow year round, like the mighty Chimborazo. 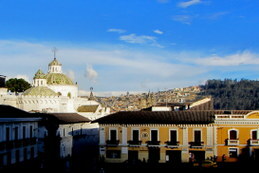 The capital city of Ecuador, Quito was named the first UNESCO World Heritage city in 1978. Draped along the shoulders of the volcano Pichincha at an elevation of 9,000 feet, the colonial district features plazas ringed by spectacular churches, cobblestone streets and a wealth of museums. Don’t miss the Convent of San Francisco, the Plaza Grande, the pedestrian-only Calle ‘La Ronda’ for handicrafts, restaurants and live music, and the Compañía de Jesús Church, a baroque icon on the Calle de Las Siete Cruces (the street of seven churches). Driving south of Quito, travelers can quickly immerse themselves in the Andean highlands with a visit to Cotopaxi National Park, featuring the spectacular Cotopaxi Volcano, one of the tallest active volcanoes in the world at 19,347 ft.
Two hours north of Quito is the charming town of Otavalo, nestled amongst the Andes. 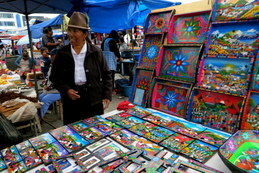 Famous for its Saturday indigenous market with local weavings and handicrafts, there are also lovely colonial haciendas nearby where you can soak up a bit of Ecuador’s past (Simón Bolívar slept here). On the way, make a quick stop at the Middle of the World exhibit, where the equator runs through Ecuador. To the northwest of Quito in Mindo, travelers can experience the Ecuadorian cloud forest, a region of great biodiversity. 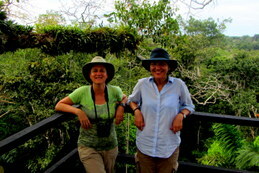 Anyone who has interest in bird-watching or native plants is well rewarded by a visit to one of several cloud forest lodges. A short flight from Quito takes you to the town of Coca, a jumping off point for travels down the Napo River, the largest waterway of the Ecuadorian Amazon and chief tributary of the Amazon itself. Experience rainforest wildlife, meet indigenous people who share their knowledge of native plants and animals, and enjoy the nightlife—cayman spotting by dugout canoe! 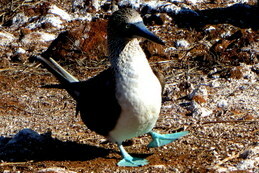 (Left) A close encounter with a marine iguana, (Right) A blue-footed booby dances to attract a mate—it’s all in the feet! 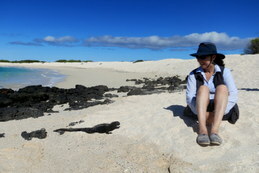 A once in a lifetime destination, the Galápagos Islands are stunning year round. Most visitors access the islands by boat, but island-based itineraries are also possible. Imagine yourself pondering the endemic iguanas, tortoises and finches just like Darwin did, or snorkeling with playful sea lions in pristine waters, where the visibility is excellent and you can see a huge variety of marine life. Warm waters favor the coastal region of Ecuador nearly year-round due to the El Nino effect. Travelers can surf, snorkel, dive, parasail or just relax and enjoy the view. 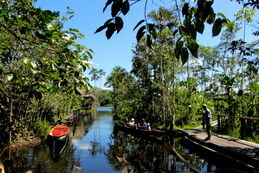 Explore the mangroves, sample the local seafood or visit a working hacienda. Ecuador is considered a year round destination, with no real seasons other than rainy or dry. One of the biggest factors in determining climate for a given region is altitude. Visitors enjoy 12 hour days all year long.